Preheat you oven to 375ºF. Peel, core, and chop apples into 1/2" cubes. You will need total 2 cups of chopped apples. Place them in a bowl and add cinnamon, white sugar, and flour. Set aside for 20 minutes so they can release the juices. In another bowl combine nuts, sugars, and bread crumbs. Set aside. Roll out one sheet of pastry into about 10"x12". Sprinkle 1/2 of nut mixture on the pastry covering halfway and place 1/2 of apples on top. 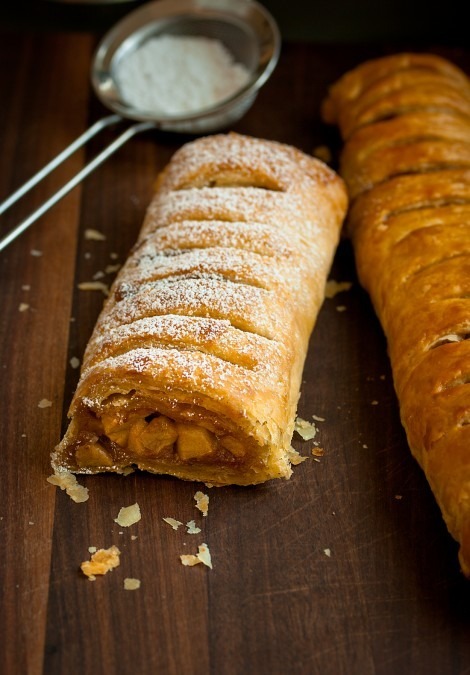 Lift up the front side of pastry and cover the apple and start rolling all the way. Finish the other sheet in the same method. Pinch the ends of each logs and tuck under. Transfer them on to baking sheet with parchment paper on it, seam side down. Brush the top with egg wash. Make a few slits on top for the steam to escape. Bake at 375F for 40-45 minutes until the crust gets nicely golden brown. Serve warm with vanilla ice cream and/or whipped cream. Enjoy!